From the same director as A Man Called Hero and Stormriders, and also very much in the same style as these films, but set in a more traditional age, is another computer GFX enhanced swordfighting adventure. The story is set in the Ming Dynasty. "Holy Sword" requests a fight with secret agent 009's friend "God of Sword" to decide the worlds best swordsman. The back of the dvd gives too much info about the film away, so here is my editted summary. 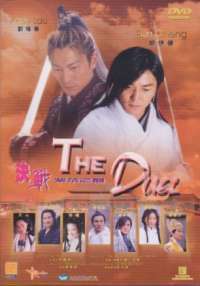 With such a highly anticipated duel scheduled to take place, it soon becomes apparent that there is also a plot to assassinate the emperor, and one of the prime suspects is one of the two men fighting in the duel. With all the evidence pointing towards him, can this man prove his innocence and save the emperor?